200 Degrees, which started life as a roaster in Nottingham, before opening its first café two years ago, has now expanded into Birmingham, hot on the heels of its second Nottingham outlet. The Birmingham branch, which opened its doors in August, is very much in look and feel like the original in Flying Horse Walk in Nottingham. Both are long and thin, replete with wooden panelling and exposed brick, although the Birmingham branch has much higher ceilings and a simpler layout. 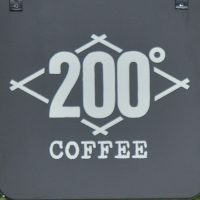 In keeping with the original, 200 Degrees is unashamedly aimed at the mass-market coffee drinker, with a plush, well-appointed interior that would put many coffee chains to shame. The house espresso, Brazilian Love Affair, has a touch of Robusta which might put some off, but it provides a strong, dark coffee that many in the mainstream will be familiar with. This is backed up by the interestingly-named Mellowship Slinky Decaf, while there’s always a single-origin guest espresso, plus another single-origin on filter which provide a path to speciality coffee for those who want to tread it. Finally, there’s cold-brew on tap, a good range of breakfast, lunch and sandwich options, plus cake, all enjoyed in very pleasant, relaxed surroundings. The new 200 Degrees is on Colmore Row, just around the corner from Snow Hill Station and Yorks Espresso Bar. Meanwhile at the other end of the street, and quite literally at the other end of the scale, there’s Jake’s Coffee Box. 200 Degrees is part of the on-going refurbishment of the iconic Grand Hotel, which sits on the northern side of Colmore Row, opposite the Cathedral. The hotel started life in 1879, but closed its doors after a troubled history in 2002. However, it’s being brought back to life, with the ground floor units given over to various shops, 200 Degrees snaffling the one on the right-hand corner, which feels like two units combined into one, the shop-front consisting of twin doors in the centre, separated by a steel column, and each flanked by a single floor-to-ceiling window. Like the original 200 Degrees in Flying Horse Walk in Nottingham, albeit in a slightly more modern building, this is long and thin. While there’s more natural light, like Nottingham, the lighting can be best described as “subdued” at the back. There are many more similarities: the wooden floors, exposed-brick walls, wooden panelling, bare light bulbs and neon fireplace decorations. There’s even an on-site barista school, although this one is in the basement rather than upstairs. The layout’s more straightforward though. Down the centre, a row of pillars marches from front to back, with five in all, each fulfilling the important function of holding up the ceiling, which soars high above you. Interspersed amongst the pillars is a row of two- and four-person tables. There’s more seating to the left, starting with a pair of comfortable chairs at a table in the window. This is followed by a long, padded blue bench, with a row of two-person tables. Next comes a pair of brick-arched fireplaces, each with a neon-light decoration. The first has a two-person table, the second, a pair of sumptuous rocking chairs. Finally, there’s a row of three tables across the back wall. On the right is the large counter, food first, then the till, and finally the coffee, centred on the magnificent Black Eagle espresso machine. A disabled toilet follows, which is opposite the fireplaces, and then, right at the back, steps lead to the basement, housing barista school and toilets. I was there for a late lunch and nabbed the last roasted broccoli sandwich. I must confess to initial scepticism, but it was really tasty. Excellent crusty bread combined with crunchy, roasted broccoli, while an interesting chutney sweetened things up nicely. I was in the mood for filter coffee, a Tanzanian single-origin, available through the Aeropress (depending on the bean, 200 Degrees also uses the V60). This was an interesting brew and, if the rest of Tanzania’s coffee is anything like this, I hope to be seeing more of it. It started off as quite a smoky, full-bodied coffee, but as it cooled it developed a really quirky, spicy taste which felt like it was tickling the front of my tongue. An interesting sensation! Finally, on my way out to catch my train from New Street Station, I picked up a rather awesome muffin. This had a liquid lemon centre and a light, fluffy body, approaching the Foxcroft & Ginger gold standard of muffins in its awesomeness. Liked this? Then don’t forget to check out the Coffee Spot Guide to Birmingham for more great Coffee Spots. This entry was posted in 200 Degrees, Birmingham, Breakfast, Cafe/Roaster, Cafes, Cake, Evening Opening, Laptop Friendly, Lunch, Retailers, Sandwiches, Stations Nearby and tagged include by Brian Williams. Bookmark the permalink.